1 Department of Surgery and Cancer, Division of Cancer, Imperial College London, Hammersmith Hospital Campus, Du Cane Road, London W12 ONN, UK. 2 Department of Physiology, University of Malaya, 50603 Kuala Lumpur, Malaysia. 3 Institute of Pharmaceutical Science, Kings College London, Britannia House, 7 Trinity Street, London SE1 1DB, UK. 4 Division of Cancer and Stem Cells, School of Medicine, University of Nottingham and Nottingham University Hospital NHS Trust, Hucknall Road, Nottingham NG5 1PB, UK. 5 Division of Medical Oncology, University of Southern California, Norris Comprehensive Cancer Center, Keck School of Medicine, Los Angeles, CA 90033, USA. * These authors share last authorship. Y. Xu, H. Zhang, L. C. Lit, A. Grothey, M. Athanasiadou, M. Kiritsi, Y. Lombardo, A. E. Frampton, A. R. Green, I. O. Ellis, S. Ali, H.-J. 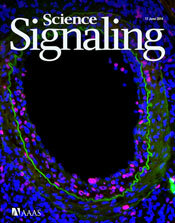 Lenz, M. Thanou, J. Stebbing, G. Giamas, The Kinase LMTK3 Promotes Invasion in Breast Cancer Through GRB2-Mediated Induction of Integrin β1. Sci. Signal. 7, ra58 (2014).